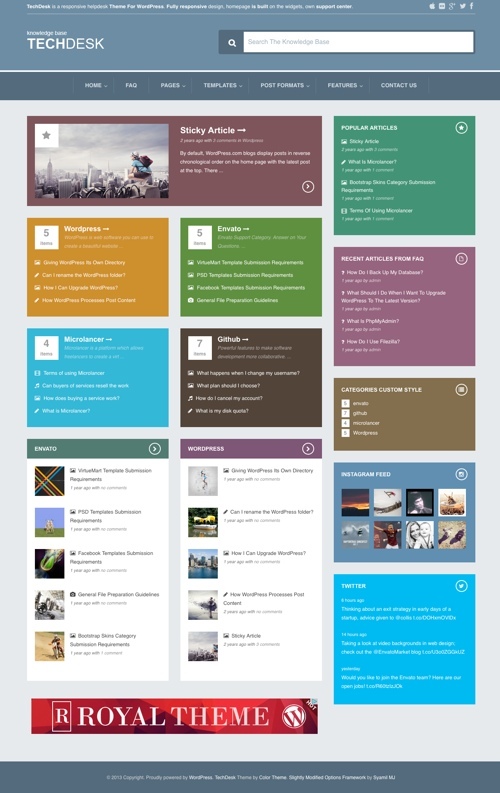 This is a collection of the best knowledge base themes for WordPress. If you need to provide support resources for customers these WordPress themes will help you build a professional knowledge base, wiki, FAQ and support website cheaply and easily. All the premium themes below have responsive designs so they’re mobile friendly, and many also include bbPress integration so you can incorporate a community support forum. Altera is a help desk, FAQ and knowledge base WordPress theme with a clean and intuitive design with heaps of great features and options. The premium theme offers a simple and cheap way to create your own helpdesk, FAQ and knowledge base of information. It’s well suited to developers as well as beginners and no expertise or technical knowledge is required to get it up and running. Some of the key features of the theme include: live search, a FAQ system, bbPress integration, widgetzied areas and shortcodes. The theme is powered by the Redux Options Panel which provides a lot of options to modify and manage any aspect of the theme. It offers unlimited layouts via the included visual page builder, unlimited colors, a mobile friendly responsive design, 10 custom widgets, support for RTL and WPML, custom logo and icons, sticky menu, Google fonts, scheme micro data support, custom backgrounds and more. Flatbase is a premium theme that provides a complete all-in-one support platform solution for WordPress. The WordPress theme from Nice Themes combines a Knowledge Base, FAQs, and Forums (bbPress integration) and a lot of other great features for a complete support solution for your products or service. 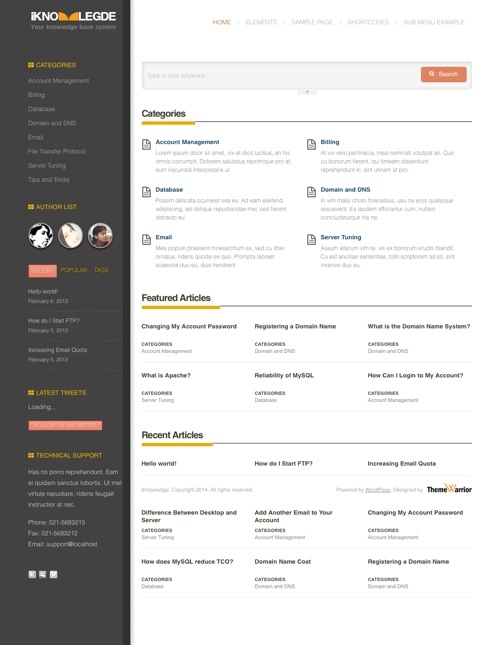 The Flatbase theme also has a clean, professional and a retina ready mobile responsive design. Some of the key features of the theme include: AJAX based live search, accordion or list style FAQ templates, bbPress integration for a community forum, a nicely crafted Knowledge Base template, box or full width layouts, custom logo and custom widgets, gallery template, theme options panel, extensive design and layout customization options and more. KnowHow is a knowledge base and wiki WordPress theme that helps you set up a knowledge base website with WordPress quickly and easily. The premium theme has a clean and minimalist design so it can be easily used with any website or product / service to provide support to your customers. 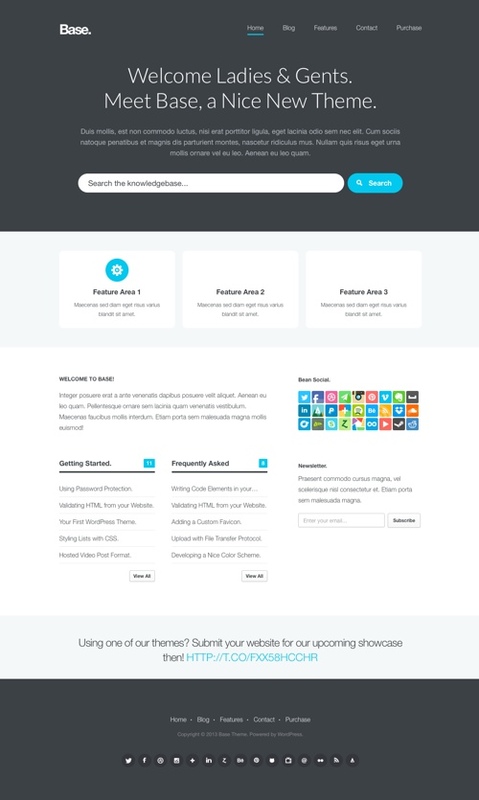 Some of the main features of the theme include: a responsive design, live search, FAQ page section, choose your own theme colors (via a color picker), WPML compatibility, video post format support, shortcodes, multilevel animated navigation, simple unbranded theme options panel and more. 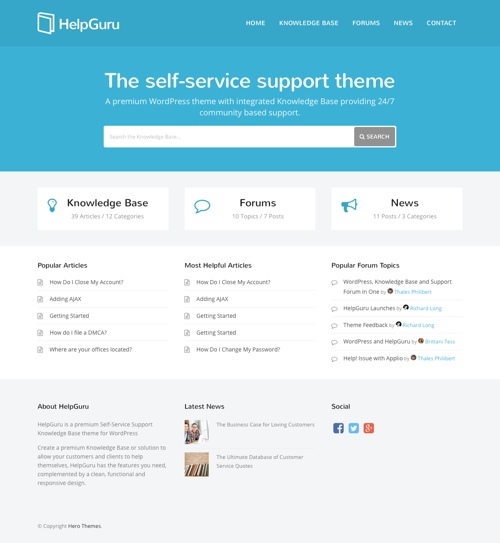 The Help Guru theme is a self-service support and knowledge base WordPress theme. The premium theme has a modern and professional design with all the features and functionality one needs to build a knowledge base website that allows your customers and clients to help themselves. Help Guru comes with the Heroic Knowledge Base plugin – a powerful knowledge base plugin for WordPress theme. The plugin provides the functionality, which is best practice for an app-like WordPress site like this. 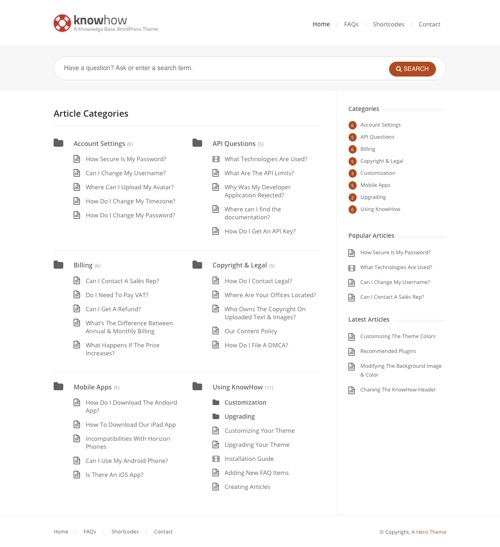 It allows you to have a fully fledged knowledge base where users can rate articles, you can organize the knowledge base with drag and drop category ordering, provide live search, and custom widgets for displaying articles, categories and authors. Some of the other notable features include: full bbPress compatibility (for a forum where can interact with customers and build a community), a mobile friendly responsive design, customization options (change colours, upload your logo and modify various elements of the theme easily), SEO optimized structure, valid HTML5 code, retina font icons, translation ready and more. 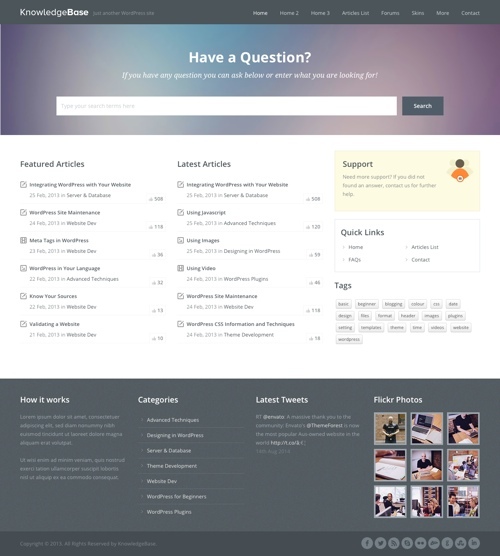 Knowledge Base is an attractive knowledge base / wiki / FAQ WordPress theme created to help you set up a self-service support site quickly and cheaply. The premium theme has quite a modern design with a big featured image, big search box, icons and other contemporary elements. It comes with a front-end visual page builder so you can easily make pages layouts as you like with drag and drop ease, unlimited colour options, and of course of responsive design so its mobile friendly to work perfectly on iPads, iPhones and all other mobile devices. Some of the other key features of the theme include: live search in the header and sidebar, and accordion style FAQ posts with the ability to create multiple pages (functionality comes via a bundle plugin), Google fonts, 17 shortcodes, translation ready, logo and favicon upload, various post formats (standard, video, audio, images etc), WPML support for multiple languages, options panel and more. KnowledgeBase is a traditional looking but professional wiki and knowledge base WordPress theme that allows customers to quickly and easily access support information in a format they are used to. The premium theme is built with Twitter Bootstrap with HTML5 and CSS3 and has a responsive design ensuring it works on big screens as well as on small screen mobile phones and tablets. The key knowledge base functionality features include: AJAX based live search (search articles, pages, forums, topics, replies and FAQs), article like counter, FAQ template, and bbPress plugin support so you can your own support forum using the bbPress WordPress plugin. The design of the Knowlesge base theme is customizable to suit your needs. It has 3 homepage templates, four colour skins, extensive theme options with text colour and background options, full localization support, various shortcodes, post format support, contact template and more. 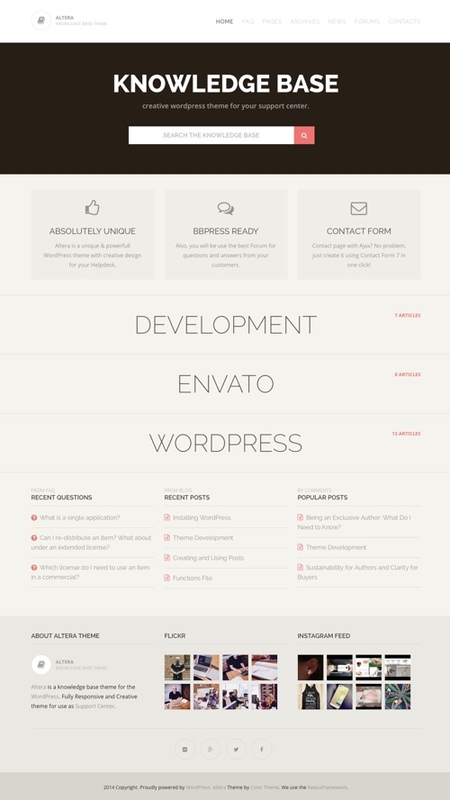 Base is a beautifully crafted knowledgebase-esque WordPress theme. The premium theme is ideal for supporting a product you sell, or if you have an exhaustive collection of help articles, FAQs, or just a large collection of articles in general. Base has a clean, bold and classic design, nice typography and three different style options. It also has a responsive design that adapts to display nicely for all mobile devices. Some of the other key features of the them include: customizable options (colours, logo etc), theme options panel, like this functionality, form builder, multiple homepage layouts, custom widgets and more. The TechDesk theme offers a simple way to create your own Helpdesk / FAQ / Knowledge Base website with no technical knowledge or expertise required. The premium theme has a clean, initiative and colorful design with a heap of features & options. Some of the key features of the Tech Desk theme include: live search, FAQ post format, 10 custom widgets, unlimited homepage layouts, a retina ready and responsive design, 5 widgetzied areas, font awesome icons, support for RTL languages, custom backgrounds, schema microdata, shortcodes and more. iKnowledge is a responsive knowledge base WordPress theme from Theme Warriors. The premium theme has a clean and professional design that focuses more on the content. It has a fully widgetized homepage that means you can control all the elements displayed on the homepage. The iKnowledge theme comes with a rating system and a post view counter so you can track article performance. Some of the other notable features of the theme include: 4 different colour styles, 9 custom widgets, one click framework update, easy to use theme options, logo and favicon uploader, shortcodes, custom page templates, localized for translation and more. 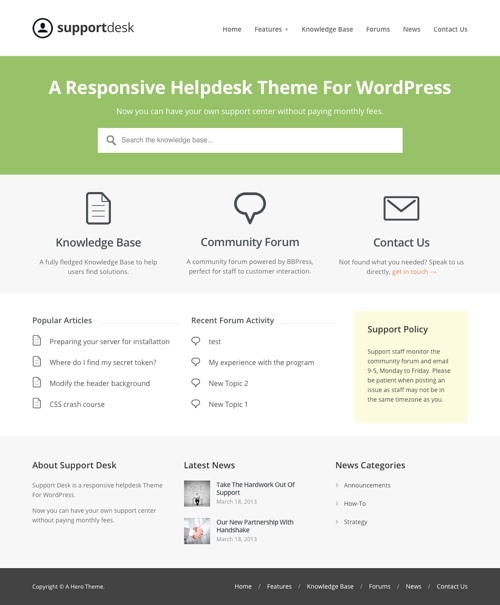 Support Desk is a fully-fledged knowledge base and helpdesk theme for WordPress. The premium theme lets you build a professional support center for your product or service without having to pay expensive monthly fees. Some of the key features include: a knowledge base (to help users from their own solutions), bbPress integration (so you can have a community forum for customers to get help from other customers and staff), live search (to get answers quickly), FAQs pages (create multiple FAQ pages for common questions that get asked again and again), colour change options (via a colour picker), a mobile responsive design, custom widgets, shortcodes, HTML5 and CSS3 coding, theme options panel and more.